Why learn Klingon? Eurotalk offer a course in how to speak the fictional language Klingon developed with the help of Marc Okrand who was originally commissioned to come up with a proper language for Star Trek the Motion Picture. There are some people who can converse in Klingon but it's mainly useful if you want to talk about starships and warp drives and other aspects of the Star Trek universe and is less adept at more mundane chit-chat. The reason for this is canonicity only words and grammar invented by Marc Okrand are considered proper Klingon so you can't make up your own words for smart-phone or takeaway. So back to my original question why learn Klingon? Fictional languages are fun and no less valid than any other form of communication but the only way you would properly get to use Klingon is if real Klingons existed and came to Earth somehow. 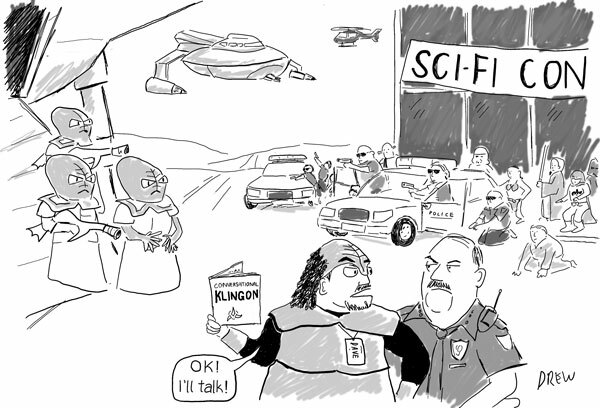 Attempting to use Klingon for it's intended purpose is what I was trying to convey in this week's CCGB caption competition.